Ontario Motor Sales | Blog | Why Have Your Service Done At Ontario Motor Sales? 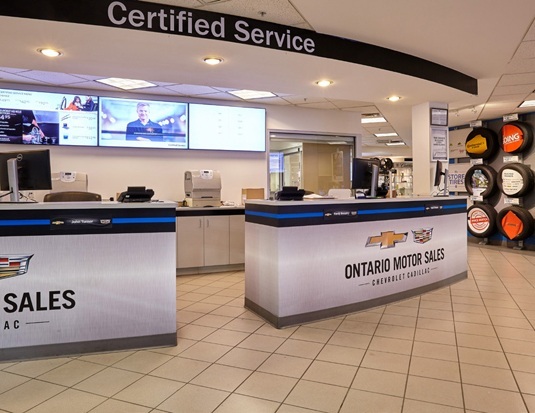 Why Have Your Service Done At Ontario Motor Sales? In today's busy world, life can get even more complicated when problems arise with your vehicle. At Ontario Motor Sales, we understand the frustration and stress that so easily arise when something goes wrong with a vehicle, or even if you are just completing your regularly-scheduled maintenance. That's why we're here to make the process as simple and stress-free as possible. Our Service Department is equipped and ready to assist you with all your needs, and we will highlight just some of the advantages we have and services we offer below. Read on! Can't make it in to the dealership while your vehicle is in our bay? We are happy to come to you! We will send our shuttle vehicles to your home or office to pick you up or drop you off. Wherever you're headed, we're happy to help! Prefer to wait while we service your vehicle? No problem—we have free WiFi in our service lounge, a free coffee machine (which also serves delicious hot chocolate, French vanillas, and more), as well as a free popcorn machine. Kick back and watch TV, surf around on your phone, or enjoy a complimentary coffee and read the newspaper. We take our job seriously and want you to consider your vehicle as good as new when it's returned to you. That's why we wash your vehicle as soon as its work has been completed. Your car leaves as shiny on the outside as it will be on the inside! 4. Free Pick Up and Delivery! Finally, we can pick up your vehicle at your home or office! Ready for a busy day at work? We will pick up your vehicle at your home or office, service it, and can return it to wherever is most convenient for you. Let us take some stress out of your hectic day! Read enough about our complimentary services? We have a number of promotions running now. Click here to see a list of our currently-running promotions and check out the video below for a demonstration of our new wheel wash machine that can give all four of your tires and rims a scrub for only $19.95! Ready to give us a call? Phone 905-725-8304 to set up your next service appointment today.